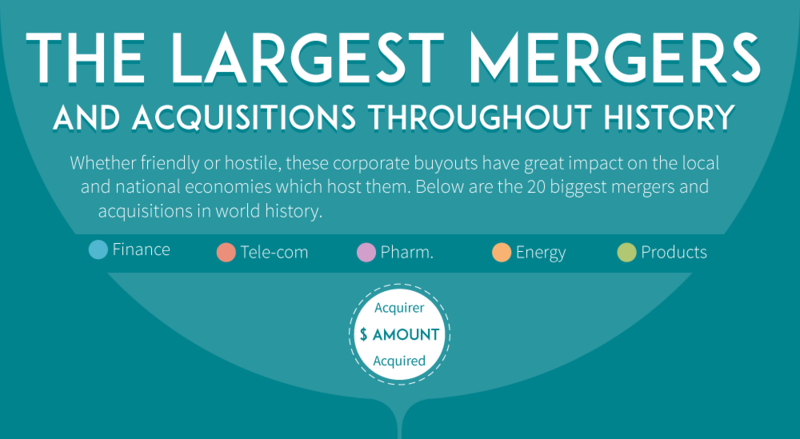 Over the last fifteen years, the world saw the largest mergers in history. From giant oil companies to telecommunication companies, companies got bigger. Mergers and acquisitions happen when one company purchases part or all of another company. These are sometimes friendly and sometimes hostile. Many people are involved, and the ramifications can be great. Shareholders lose (or gain) equity, employee jobs and benefits are lost, stress for remaining employees increases and tax revenue disappears for the cities and municipalities where the company is based. The largest 20 corporate mergers where so large, that thousands, if not millions of people were affected. These corporate buyouts have great financial and psychological impact on the local and national economies that host them. 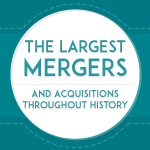 Below are the 20 biggest mergers and acquisitions in world history that encompass the finance, telecommunications, energy, pharmaceutical and consumer products industries. In 1998, Nation’s Bank Corp. acquired BankAmerica Corp. for $61.6 billion, with Nations Bank offices becoming Bank of America. In the same year, the Travelers Group bought Citicorp for $72.5 billion, a relative steal at the time. 1999 witnessed AT&T Corp. purchasing Tele-com Inc. for $69.9 billion while European competitor Vodafone Group acquired AirTouch Comm. for $65.8 billion. French pharmaceutical company Sanofi-Synthelabo acquired Aventis for $65.6 billion. As Y2K proved to be a non-event, year 2000 saw SBC Communications acquiring Ameritech Corp. for $70.4 billion. One of the world’s largest oil companies, Exxon Corp., acquired Mobil Corp. for $85.1 billion while the largest acquisition of all time took place as Vodafone AirTouch acquired Mannesmann for $202.8 billion. While nowhere near this amount, Pfizer, Inc., acquired Warner-Lambert Co. for $88.8 billion. In 2001, GlaxoWellcome acquired SmithKline Beecham for $78.7 billion in another instance of the pharmaceutical industry shrinking. 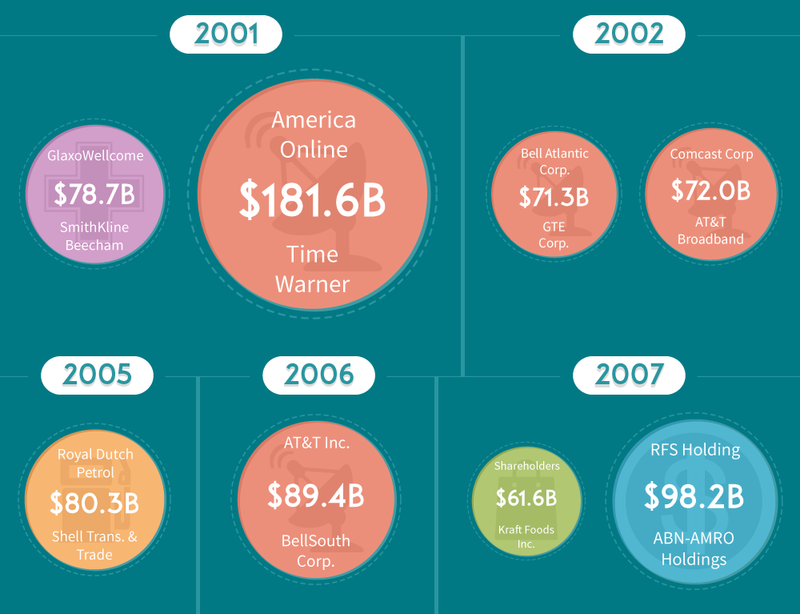 2001 also saw the second-largest acquisition in history as struggling America Online acquired Time Warner for $181.6 billion. Bell Atlantic Corp. acquired GTE Corp. for $71.3 billion in 2002. During the same year, Comcast Corp. acquired AT&T Broadband for $72.0 billion. In 2005, Royal Dutch Petrol acquired Shell Trans. & Trade for $80.3 billion, creating Royal Dutch Shell. 2006 saw AT&T Inc. acquiring BellSouth Corp. for $89.4 billion, despite reservations from anti-trust regulators. A year later, Altria spun-off Kraft Foods, Inc. to its shareholders for $61.6 billion. RFS Holdings acquired ABN-AMRO Holdings for $98.2 billion, making it the fourth-largest acquisition of all time. In 2008, shareholders acquired Phillip Morris Intl. for $113.0 billion, making it the third-largest acquisition in history while Gaz de France, a French transportation company, acquired Suez for $75.2 billion.